Fulfill a contract for the Companions to bring a citizen back in line. "I just need you to go out there, look tough, and scare this milk drinker into submission." Speak to the assigned target. Brawl with them to send a message, but don't kill them. Note: it is best to complete this quest as soon as possible after receiving it, because many of the quest targets can possibly die (either through random or scripted events), at which point it becomes impossible to ever complete the quest or take any other jobs for the Companions. 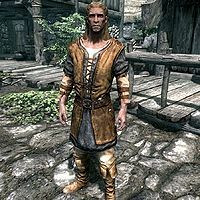 Farkas has gotten word that a citizen has been causing trouble for someone in their city. He needs you to go and rough up that person in order to bring them back in line. Farkas will remind you that you are just to send them a message, not to kill them. The possible targets include more than 400 different NPCs, encompassing nearly every citizen in Skyrim. The NPC will be located in a hold that you have previously visited, so early in the game you may only be given NPCs living in Whiterun Hold, but later in the game there are many more possible options. The NPC may live in a city, town, or a remote settlement. Once you have traveled to the target's location, talk to them and select the dialogue option to brawl with them. It is best to start the brawl in an area with as few other NPCs as possible. In particular, it is best to have any follower wait in a different room. You may not use any weapons, magic, or shouts during a brawl. Winning a brawl gains you the respect of your adversary, as their disposition toward you will become more favorable afterwards. If anyone else becomes hostile as a result of your brawling, you should be able to run to a guard and yield to him, clearing any hostility. If you kill the target, you will still complete the quest. The quest is marked as "Failed" in your quest journal, but it is no longer active, and you will be allowed to pursue other jobs in the Companions questline. Farkas will not be pleased, and you will receive a decreased amount of gold for your reward. Return to Farkas for a gold reward. If your target is someone you can fight for money, you can collect a reward from them after the fight, even if you've already won a bet with them previously. If your target is someone you can brawl for another quest (such as Mikael), winning a brawl will complete the objective for both quests simultaneously. There is a silent Intimidate check against the target as part of the quest's startup conditions. If it succeeds, you won't get the quest. If one of the targets dies before you get the quest, you can no longer finish the quest or take any other jobs. ? You can reload a save before taking the contract. Type Setstage cr04 20 into the console. Some targets reside in locations that require you to trespass. In these cases, your target's dialogue will constantly loop "You're not supposed to be in here" and not allow you to initiate the brawl, rendering the quest impossible to complete correctly. ? Assault the target and then run to a non-trespassing location out in public, where the target will follow you. You can then yield by sheathing weapons, calm the target by using the Voice of the Emperor power, pay the fine for assault, or go to jail and hurry back to the target. Use the console commands prid and your target's RefID, then movetoplayer to move the target to you, and the brawl can be initiated without committing a crime. You may clear the quest from your active quest list by killing the target and thus failing the quest. After killing the target, return to Farkas and he will give you a lesser amount of gold for your payment before allowing you to take another job. It is also possible to get a target that has disappeared from the game. For instance, Atar after you have convinced him to leave. ? Typing Setstage cr04 20 into the console will allow you to skip the intimidation step and complete the quest. If the quest target doesn't have conversation topics then there will be no option to start a brawl and the quest won't completeable. ? 10 <Alias=Brute> has been causing trouble for someone around <Alias=BruteTown>. I need to rough <Alias.PronounObj=Brute> up to remind <Alias.PronounObj=Brute> of <Alias.PronounPosObj=Brute> obligations. The following empty quest stages were omitted from the table: 0, 1, 200. On the PC, it is possible to use the console to advance through the quest by entering setstage CR04 stage, where stage is the number of the stage you wish to complete. It is not possible to un-complete (i.e. go back) quest stages, but it is possible to clear all stages of the quest using resetquest CR04. This page was last modified on 5 December 2017, at 04:33.